Ever feel the need for a 1000+ hp car? The production car Bugatti Veyron comes in at a million plus. There are other cars that claim more than 1000hp, but most are closer to a garage built car, than a true production car. Tuner cars at more than 1000 hp are fairly common place. Twin turbo Lamborghini's, Ford GT's and others. 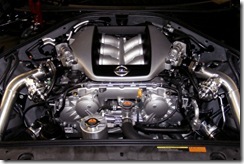 For the cost of a GT-R, $65k, and labor, you can build your own 1000 wheel horsepower GT-R. In this video, a Swtizer built GT-R does a few runs. In the 45 degree temps, the summer tires have a little bit of a hard time hooking up, but once they do, this thing really goes. The car features the Switzer stage 1 engine upgrade, plus a full R1K kit, that covers modifications to the engine and driveline to be able to put this kind of power to the ground.